Moltisanti wrote: Would still like to see Adkins be a part of it. But with these sort of films the dates seem to constantly change and Adkins seems to go from film to film pretty quick with not much downtime in between. Guess it comes down to schedules. Yeah. Though last year it was set to be shot and located in London (which would have been cool to see), so having Scott Adkins playing a detective made sense there, I'm not sure it does now if the story takes place in Rome. 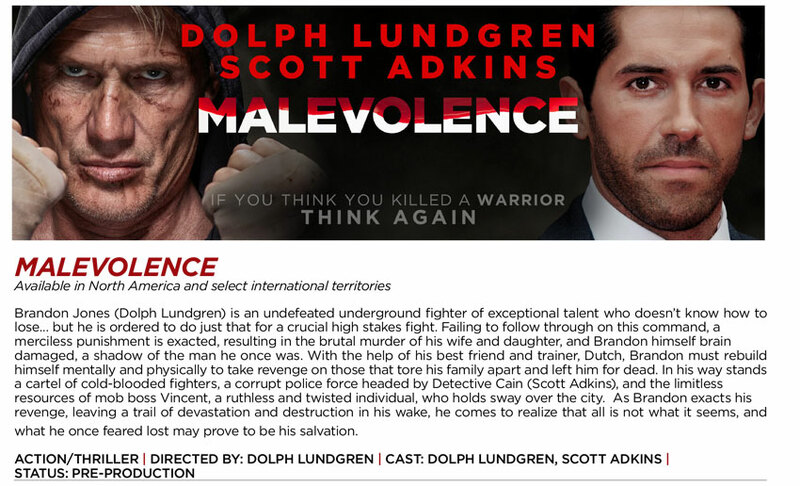 Any updates regarding Malevolence? Is it still happening this year? When THE TRACKER was made last February/March, MALEVOLENCE was supposed to start production in September but now it seems schedules changed with the British TV show, then the PR blitz of CREED II and AQUAMAN might keep busy in the winter. Well, Dolph said he was getting ready to shoot a film in Rome in september Could it be that ? Great year for Dolph. If Aquaman and Creed II prove to be any good this will be his best year since 2010. Scott Adkins is Europe right now, and he will soon be finished with Jesse Johnson's Avengement. I wonder if he's still part of Malevolence. Nathan wrote: Great year for Dolph. If Aquaman and Creed II prove to be any good this will be his best year since 2010. Yep. Gonna be a big year for our favorite Swede. On the page, the project really sounds much better than what it seems. I'm looking forward to that (and he seemed enthusiastic in that little interview). Adkins said he was taking some days off in Majorca and going back to work right after his vacations, I'M wondering if it's to work on Malevolence. I would be all for it, even if an english actor might seem odd playing a cop in Rome (but I guess you can make some writing moves to make it work). Well, it's not surprising. I wouldn't hold it against Adkins if he decided not to do M because of that. I trust in Dolph to find good "opponents" (I watched The Mechanik again a few weeks ago, and Ben Cross, even if he was "advised" by Nu Image, was a good "sidekick"). I hope Vmi (if they still are in the game) and Sun Film will let Dolph free to do the movie he wants.